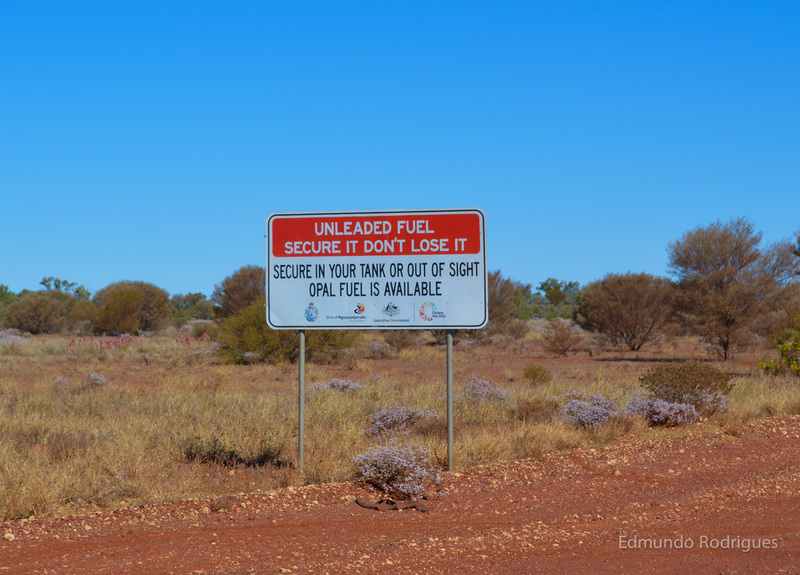 As advised by the numerous road signs when entering Aboriginal Land, we used all of our regular gasoline as only Opal fuel is permitted within Aboriginal reserves. This was an effort to combat the sweeping addiction to gasoline sniffing, as Opal fuel is less volatile and therefore less fragrant providing a less addictive alternative. People wishing to complete this stretch of road are recommended to carry extra fuel, which enclosed in bright red jerry cans attract potential thieves; as a result travelers are urged to lock their reserve fuel cans. Secure it don’t lose it! Having come to Yulara with great expectations, we quickly realized that what appeared on the map as a town turned out to be a tourist resort with inflated prices, most notably, the petrol at $2.17 per liter. As is recommended to every visitor, our first stop in Uluru-Kata Tjuta National Park was the cultural center. These natural wonders are of extreme cultural significance to the aboriginal Anangu people. Both Uluru and Kata Tjuta are part of coming of age ceremonies, the details of which are not openly shared by the Anangu people. Kata Tjuta with its highest peak at Mount Olga (546 m). After a busy day in Alice Springs, we finally had Bertha back in shape and were ready to get back on track. Our next destination was Uluru, the infamous red rock in the middle of Australia. Sixty kilometers south of Alice Springs we headed down a 4 wheel drive only track, which took us to the Owen Springs Reserve. This gave us a better idea of what to expect from Australia’s off-roading trails, such as heavy corrugation but also the ability to go where most people can’t. Being unimpressed with the reserve itself, we got on the road early and had breakfast by the roadside, as has become quite frequent in our daily routine. Classic breakfast on the side of the road. We continued deeper towards Australia’s red center through a series of off-roading detours, which lead us to Finke Gorge National Park. We quickly realized how remote we could get in a few hundred kilometers. Although way outside of mobile reception, we came across a diverse landscape, which included wild horses and aboriginal settlements. Spending our first night truly in the middle of nowhere gave us a glimpse of what would soon become routine through the more deserted parts of Australia. We got on the road early, excited to see the mining town and self-proclaimed opal capital of the world. With its underground churches, bars and living quarters, Coober Pedy had all the boxes ticked for an interesting and welcome break to the monotonous desert landscape. Numerous mounds of dirt and signs advising not to walk backwards made it impossible to miss the town. 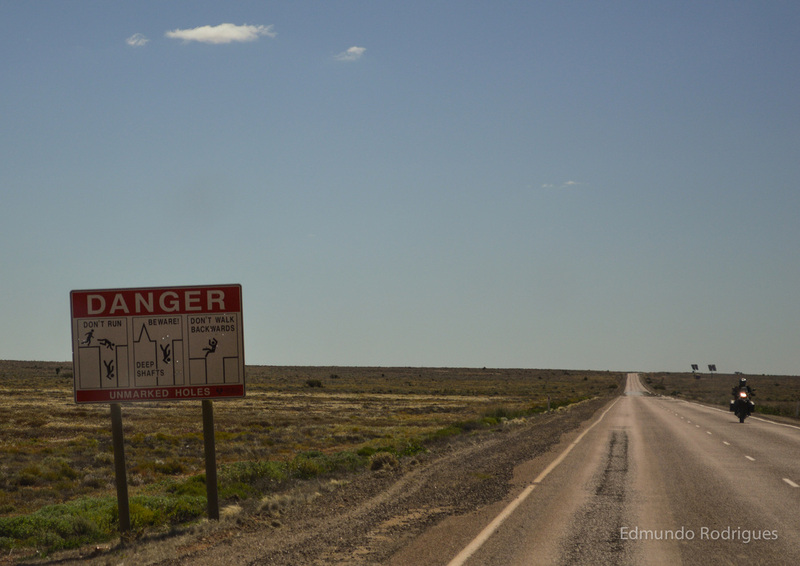 Informative signage on the outskirts of Coober Pedy. After a small taste of Adelaide, we quickly realized we weren’t quite ready to spend time in a city. 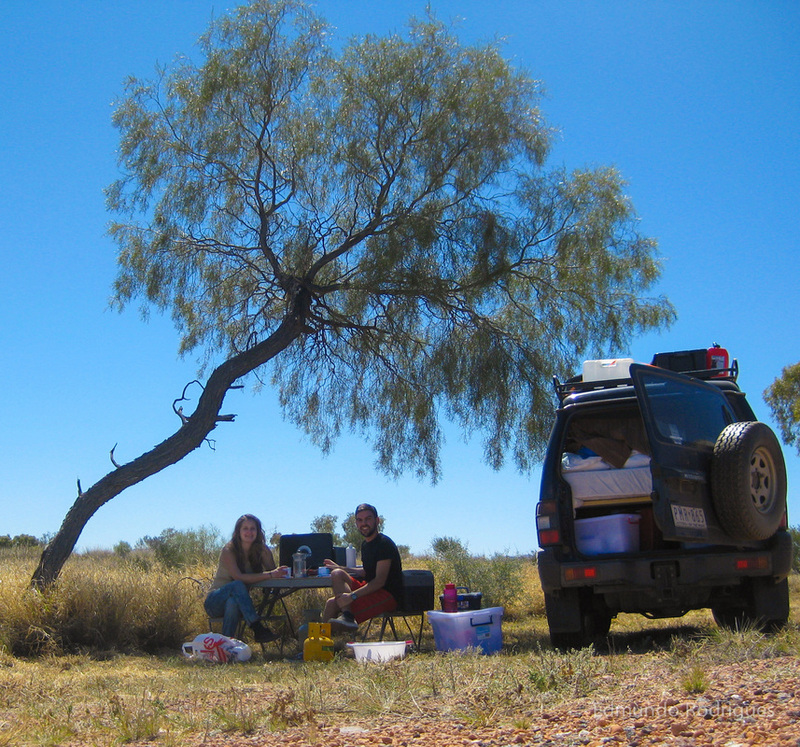 Opting for the serenity of the open desert, we started heading towards Alice Springs and, of course Uluru. 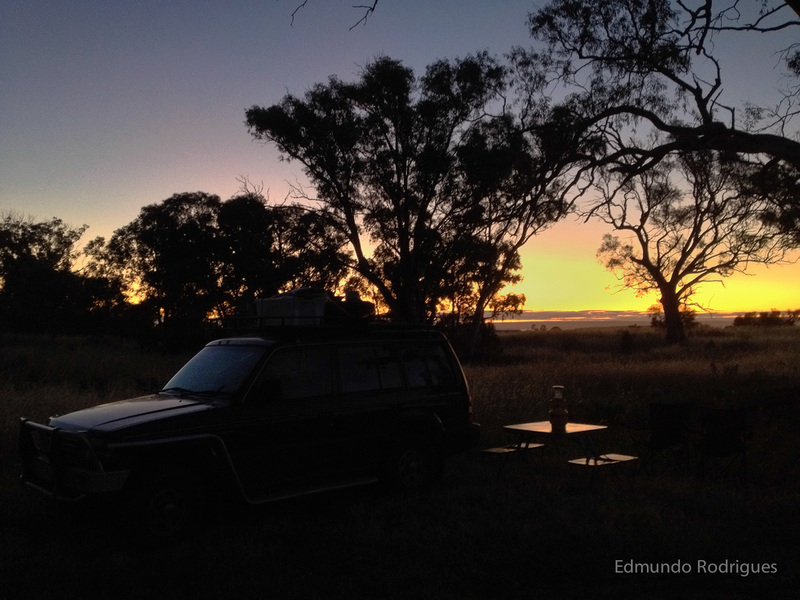 On August 18th we made it to Mount Remarkable National Park, which offered a campground for $18/night. As has become our usual assessment, we thought this was too hefty, and instead went on the lookout for a sheltered spot we could have all to ourselves. It didn’t take too long before we settled in to what seemed to be an almost abandoned dirt road. We had taken out all of the necessities, and had just about relaxed to watch the sunset when a car came to a stop beside us. The driver informed us that we were on her property, and that this seemingly abandoned road was actually her driveway. It turns out we found an even better, more secluded spot for the night; here we enjoyed the sunset and marveled ourselves with the 53.5 meter long road trains shooting by. 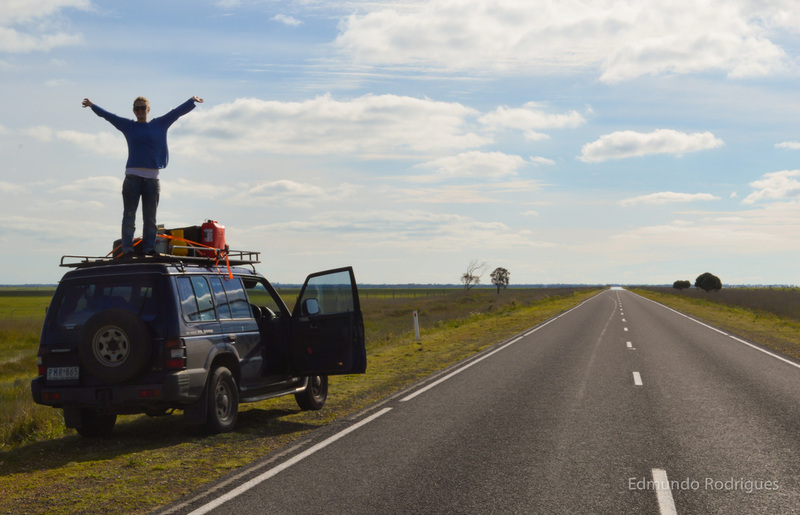 Given we spent the night on private property, we decided to start our day extra early and head towards Mount Gambier. This big, small town was our pit stop for groceries, but also an unpleasant surprise in the form of the realization we had a punctured tire. We continued south towards the coastal town of Port MacDonnell. Once the second largest port in Australia, this town proved to be quite deserted during the winter season. Nonetheless we had breakfast by the sea, and headed inland to find long, straight highways lined with never ending farming plains. After having a leisurely breakfast at our campsite in Johanna, we headed off to complete the most tourist-oriented part of the Great Ocean Road. On August 14th we saw the 12 Apostles, and the Gibson Steps, which were originally carved by hand by Mr. Gibson himself. These allow for a comfortable descent of the steep cliff in order to reach the shore. After these attractions the highway became surrounded by what seemed to be mostly cattle farms. We even bought some fresh cheese from Cheese World, located across the street from a dairy factory. After experiencing the necessity of a camping lantern the previous nights, we made a pit stop to acquire one. A friendly local suggested a nearby campground, where we reluctantly paid for our first campsite, but also enjoyed our first warm showers since leaving Melbourne. August 15th was our first completely sunny day. We took advantage of this by detouring to the Cape Nelson Lighthouse, which is Victoria’s most intact lighthouse complex. Built in 1884 and 32 meters high, this lighthouse provided safe passage for ships traveling through the harsh environment of the Southern Ocean. We left Melbourne late in the afternoon on August 12th and headed towards Torquay. We spent the night in the town of Lorne, and woke up early to continue our journey. On the 13th we contoured Cape Otway, which separates the Tasman Sea from the Southern Ocean. Much of the Great Ocean Road has been deserted so far, so much so, that the 36 km stretch between Lorne and Apollo Bay will be closed for a week. A large pyramid has been discovered underwater between the islands of Terceira and São Miguel, which are part of the archipelago of the Azores. At an approximate height of 60 meters, the structure boasts an area of 8000 square meters. The finding of a pyramid in the middle of the Atlantic Ocean could reignite the debate around the existence of Atlantis, since there have been numerous postulations that the Azores could be the possible location of the mythical island. (How) we did it - Europe just banned bee-killing pesticides!! The following "article" is an AVAAZ email, thus it's not written by idea mater editors. We hereby reproduce it in order to highlight AVAAZ's work and for a better understanding of the bee conservation struggle. All images and text by AVAAZ. We did it -- Europe just banned bee-killing pesticides!! Mega-corporations like Bayer threw everything they had at this, but people-power, science and good governance came out on top!! idea mater is a series of articles, ideas and reflections written and compiled by Rafael Fraga and Edmundo Rodrigues. Topics such as history, science, art or life-style are presented with a hint of personal opinion. I do not drink. So what?